At work, a colleague showed me a picture of an elaborately carved pumpkin he and his children carved over the weekend. It was amazing. I asked him how he did it. He said, “you didn’t know that there are now stencils that you can use and tools especially made for elaborate Halloween pumpkin carving?” I immediately called the mothers of our grandchildren. They did not know either. When I went on line I found out that you can simply select your favorite stencil, place it across the pumpkin, use the drill to punch the pattern into the pumpkin pulp, then carve out the punched pattern with the special saw. Stencil patterns include spooky spiders, creepy cats, skull and bones, vampires, witches, or you can go Disney and sweet, even super heroes. This inexpensive set includes 12 Stencil Patterns which vary slightly in size, but are approximately 7 Inches in diameter. The kit includes a drill, scoop and saw. Although recommended for Ages 8 and up, it can be used for younger children. On Amazon you can get prime shipping and have it well before Halloween carving time. If you so not need the utensils, this book is for you. It is very inexpensive, contains 12 different easy to use designs, reusable if traced onto pumpkin. The book is 11″ tall. 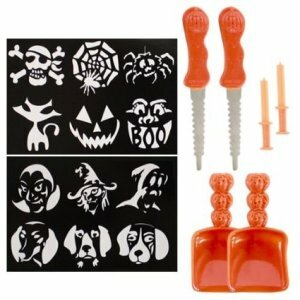 It makes carving pumpkins with beautiful designs quick and easy. Recommended for Ages 4 to 15. On Amazon you can get prime shipping and have it well before Halloween carving time. For those who love Disney, there are even kits with Disney Fairy stencils and tools included at a very reasonable price. The kit includes 3 plastic tools – punch, scoop, and a small saw and 7 stencil patterns. It is an officially licensed Disney accessory. Recommended for Ages 4 and up. On Amazon you can get prime shipping and have it well before Halloween carving time. Or there are Disney Princesses.